Ironically, while the left is one of the fiercest critics of biased media coverage, it can also fall in the trap of corporate media distortions, particularly if its coverage dovetails with its own fantasies. A May 14 article by Daniel Lopez published on the website of Australian group Socialist Alternative is proof of this. The article echoes the view of a May 10 article on the BBC website, which has a clear dislike of Bolivian President Evo Morales. The BBC article argued a “general strike” by Bolivian unions marked “the end of the honeymoon period between the left-wing Mr Morales and his power base among the country's poor”. This position fits nicely with the outlook of Socialist Alternative, which also condemns Bolivia’s first indigenous president. Lopez wrote that Morales’ moves “against the working class” have led to “the first large scale action of workers in opposition to the Morales government”. According to Lopez, “demonstrations were held around the country [on May 4], accompanied by a 24-hour general strike which was then extended indefinitely”. Despite the “sell-out” of the Bolivian Workers’ Centre (COB) leadership, Lopez assured us “the strike is well into its second week”. A deal struck between Morales and the COB has been “resolutely rejected”, Lopez said, and “the strike continues”. On May 1, as well as nationalising four electricity companies, Morales restated his government would not increase workers’ salaries by more than 5%. This was met with protests in various cities, the largest of which was the COB-organised rally in La Paz. One indication of its size is La Prensa’s report that a 300 strong contingent of factory workers (whose union was a key organiser of the protest) tried to jump in front of the miners at the front of the rally, leading to clashes. COB general secretary Pedro Montes announced a follow-up 24-hour strike for May 4. Reporting on the May 4 “general strike”, Bolpress said, “hundreds of teachers, factory workers and health workers .... alternated down the Prado in La Paz” in divided marches. La Prensa said “at least 500” factory workers descended on the labour ministry, where they attempted to burn down the front door, leading to 15 arrests. Pedro Alberto Calderon, a leader of the La Paz factory workers, continuing the dispute with the miners by calling Montes’s his expulsion from the COB “because he has betrayed the whole working class” by not marching in La Paz, La Prensa said. 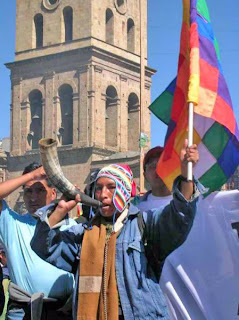 Montes instead chose to join a miners’ march in Oruro. News sources also reported 500 health workers marched in Santa Cruz. In Cochabamba, factory workers blocked the local bus terminal. About 500 to 1000 marched in Sucre and smaller protests were held in the other capital cities. “In the combative city of El Alto”, Bolpress said, “productive activity was normal”, as in most of Bolivia. On May 7, a COB assembly called for an “indefinite general strike” to begin May 10, La Razon said. Bolpress said that day, Bolivia’s largest peasant organisation, the United Confederation of Bolivian Peasant Workers (CSUTCB), the national women’s peasant federation, the coca growers’ union from the Chapare, and the Departmental Workers Centre of Santa Cruz defended the government and against COB’s actions measures, because “they only hurt the brothers and sisters of the countryside and the country”. The CSUTCB is the largest COB affiliate, representing 1.5 million peasants. It is a key part of Morales’s Movement Towards Socialism (MAS) party. By May 11, everyone agreed the “indefinite general strike” was a flop. La Razon’s website that day read: “Scarce support for general strike”. Union leaders representing teachers, health workers and factory workers did not strike, but were negotiating with the government, La Razon said. In an article headlined “The government’s offers weaken COB protests”, Bolpress said union divisions “weakened to the point of converting to almost null the general strike”. Instead, La Prensa said, 300 workers, mainly miners, gathered in Caracollo to begin a 200km walk to La Paz. The night before, the COB and the government reached a tentative agreement to lower the retirement age from 65 to 58 (51 for miners). Bosses would also be forced to contribute to workers’ pension funds. The COB, affiliated unions and government officials began to discuss the new proposals. Bolpress said that, although the COB agreed to the new proposals, some teachers, health workers and factory workers rejected it. La Razon said after futher discussions, the health workers’ union also agreed to the government proposals and called off future actions. A small contingent of mainly teachers continued the march to La Paz. Factory workers and teachers pledged to once again “radicalise” their protests on May 18. They also continued to call for Montes’ removal and the sacking of several government ministers. By May 17, La Prensa said the La Paz factory workers’ union had decided to postpone their actions. Union leader Wilson Mamani said the decision was taken at the request of other factory workers around the country. On May 18, media reports said between 3000 and 15,000 teachers arrived in La Paz, culminating the march from Caracollo. The National Confederation of Urban Teachers, however, was no longer supporting the march, although it continued to oppose the government’s position. Teachers’ union leader Federico Pinaya told La Razon some sectors of the union were trying to use the protests in the lead up to internal union elections. Rural teachers unions pulled out of the protests and returned to the negotiating table. By May 21, the only sector still protesting was a militantly anti-Morales section of the urban teachers union, who were demanding their wages be brought to the level of rural teachers. But even the leaders of the teachers’ union have since come to an agreement with the government, subject to approval from the membership. The small scale of the strikes and protests does not mean the government’s proposed pay rise should not be debated or challenged. There are tensions between the Morales government and its base. In the April 4 national elections, MAS faced more competition from dissident MAS sectors than right-wing forces. The Morales government has also had to confront a range of small, but significant, conflicts with sectors traditionally aligned with MAS. It is clear the movement for change in Bolivia needs to reflect on some of these warning signs. However, confusing an “indefinite general strike” with a lot of huffing and puffing by a few union leaders, and symbolic protests, mixed with a good dose of internal union politicking, only leads us away from the real issues. Today, the Bolivian workers’ movement is far from the powerful force some Bolivian union leaders and foreign leftist like to fantasy it still is. Bolivia’s organised workers’ movement is still suffering from the defeats inflicted by the implementation of neolibeal policies. About 62% of the working class is in the informal sector, 83% in small companies with less than 10 workers, and the unionisation rate is only 23%. This rate has steady increased under the Morales government. Nor is this the same Bolivia as in the past. The 1970 COB thesis Lopez quoted approvingly does not mention the word “indigenous” once, despite the long-oppressed indigenous peoples making up about two thirds of the population. If this policy of refusing to acknowledge indigenous peoples’ existence was mistaken then, it is criminal today. Today, a revolutionary movement has developed, whose future is still to be determined — even if it didn’t occur according to COB theses or manuals from afar. With the COB in steady decline, it was indigenous and peasant sectors that led the resistance to the military dictatorship in 1978, and constructed the CSUTCB as its own independent organisation in 1979. These sectors led the process of recapturing the historically marginalised indigenous peoples’ self-identity and pride. The resistance to neoliberalism over 1990-2005 did not emerge from the factories. It began in the countryside and spread to indigenous workers and the urban poor. The main indigenous and peasant organisations decided it was necessary to move from resistance to taking power. In the 1990s, they decided at a congress of Bolivia’s most powerful unions to build their own political instrument to this end — creating what is now the MAS. As a result of this historic decision and the mass struggles that followed, they put one of their own in the presidency in 2005, electing Morales with a record high of 54% of the vote. A new constitution incorporating the rights of indigenous peoples, the start of land reform, the nationalisation of important natural resources and increased state social spending to the poor are some of the gains won since. Lopez’s article mentions none of this. Morales also plays a leading role internationally in attacking the capitalist system for its responsibility for the climate crisis. Morales hosted a “people’s summit” in Cochabamba in April that brought together 35,000 people from around the world to organize to fight back. This does not mean the government cannot be criticised or that workers should not fight for their demands. But to paint the Morales government as the main enemy because of a dispute over wages, while failing to mention even once the suffering and resistance of the most marginalised who have benefited most from the Morales government, is blind sectarianism. To raise the wage demands of sector of workers as the central issue in Bolivian politics, while ignoring the changes under way and the challenge any revolutionary government would face in lifting South America’s poorest nation out of poverty and dependency, is pure and simple economism — that is, counter-posing demands about wages to the broader struggles of the oppressed. Such positions are rejected by Bolivia’s indigenous majority because they understand that, for the first time, they are charting their own path towards liberation. Bolivia’s revolutionary process needs a strong independent working class to help push it forward. But those who denounce anyone who tries to relate to this reality as “sell-outs” don’t help such a cause. There will be a lot of dis-information coming out about Morales and his policies. The globalists have put Bolivia on their target map. They do not want to see any country where the Govt. in empowering their people. They absolutely do not want to see a natural resource rich country like Bolivia nationalizing their resources. I expect these globalist saboteurs of society to come out and call Morales and other leaders with the same mind set Communists.